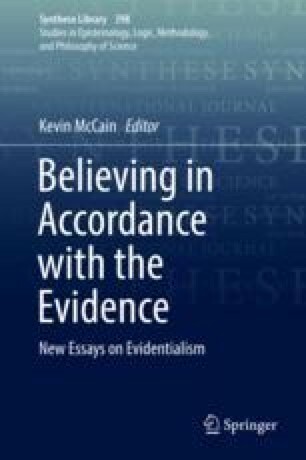 Let ‘strong normative evidentialism’ be the view that a belief is doxastically justified just when (i) the belief is (properly) based on evidence in the agent’s possession, and (ii) the evidence constitutes a good reason for the belief. Strong normative evidentialism faces two challenges. One is that of explaining which kinds of evidence can serve as a good reason for belief. The other is to explain how inferential justification is possible. If a belief p is based on a belief q that justifies p, then it would seem that the subject would need to be justified in believing that q makes p likely. The problem for the evidentialist is to explain what justifies this belief about likelihood. I will argue that the evidentialist can respond to both worries by construing basic evidence as seemings and then adopt a version of phenomenal dogmatism – the view that seemings can confer immediate and full justification upon belief – that takes seemings to be good reasons when they are evidence-insensitive in virtue of their phenomenology. This view meets the first challenge by explaining what kinds of evidence constitute a good reason. It meets the second challenge by taking beliefs that one phenomenon makes another phenomenon more likely to be immediately and fully justified by memory seemings.